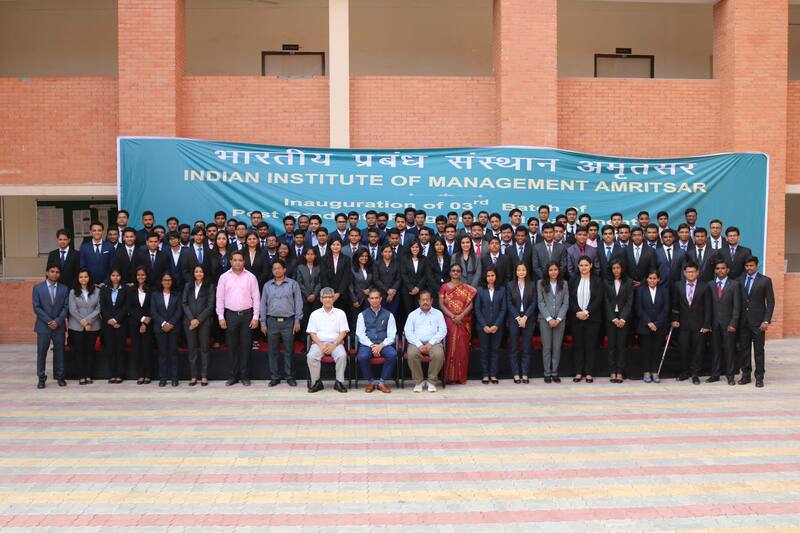 Indian Institute of Management, Amritsar successfully conducted the second edition of annual Finance and Marketing Conclave, Pariprekshya’18 on October 13, 2018. The event was graced by the presence of renowned industry experts from firms like Kotak Securities, Swiggy, BMW India, Fitch ratings, Philips, Accor Group of Hotels, Reliance Capital and Jabong. There were two panels, one for Marketing and one for Finance under Pariprekshya’18. Pariprekshya’18 witnessed the stalwarts from the industry discussing and providing various thoughtful and factual insights about “The Financial Prudence in India – Current Scenario and Way Forward” and “Re-inventing Marketing for Loyal Customers”. The students and panellists alike used the platform to discuss their views and learnings about the aforementioned themes. The eminent panellists for the Finance Panel included Mr.Trivikram Kamath, EVP & Head, Operations, Finance & Technology, Kotak Securities Ltd; Mr. Rahul Bothra, CFO, Swiggy; Mr. Salil Garg, Director, Fitch ratings; Mr. Vinay Guptaand the discussion was moderated by Mr Krishna Ramachandran, Global Head, R2R & Lead, RPA, Philips. For the Finance Panel,the dignitaries discussed the financial prudencein Indiain the light of ongoing IL&FS crisis and inferring from previous global issues. They shared their key insights about the risks and rewards the bankers and investors should focus on. They also discussed how the start-ups that are most risk averse, take financial prudence into perspective and how their valuation increases with the magnitude of risks they are ready to take. Financial prudence is the ability to guesstimate and estimate where to invest and grow. A robust financial market is necessary to become estimated and expected to be $ 10 trillion economies in 12 years from now. Banks too should have stop losses for projects just like traders have for stocks trading. P&L comes and goes, balance sheet stays forever. The eminent panellists for the Marketing Panel included Mr. Inderpreet Singh, Head Marketing Communications, BMW India, Mr. Umesh Rao, Ex – SVP & CMO, DHFL Pramerica Life Insurance Ltd, Mr.Soumonath Chatterjee, Director, Loyalty, Guest Experience & Distribution, Accor Group of Hotels, Mr. Abhay Kumar, Group CMO, Reliance Capital, Mr. Satyarth Priyedarshi and the discussion was moderated by Mr Saurabh Srivastava, Independent Consultant, Ex- CMO Jabong. For the Marketing Panel, the dignitaries discussed Re-inventing Marketing for Loyal Customers. All the panellists agreed unanimously that there is a perception about brand loyalty that does not align with its fundamental definition. Brand loyalty should not be confused with brand habits or the inertia and should not be linked or seen with the switched-out costs. The 4 Cs – Commoditise, Cost, Crowd and Consistency are essential to winning the confidence of customers. Customer satisfaction could be driven purely out of sheer habits. When these habits are supported by emotions, brand loyalty is born. Aspiration is a driver of loyalty. The omnichannel strategy is necessary to develop a sense of loyalty among consumers. The panel concluded that values must match the aspirations of the consumers. There is a need to honour the choice of a consumer and be well informed about their preferences to invoke loyalty towards the brands. Consistency is the key to re-invention and sustenance in the market. The session was followed by an interactive and enriching Q&A round, that helped the students to clear their doubts regarding the financial prudence and the ongoing IL&FS crisis. Reflecting on the whole discussion, the dignitaries provided insightful conclusions. NPA clean-up is like the Ganges clean-up which is mandatory to clean out the dump of debt so that economy flows smoothly. Finally, all of us know what is right or wrong and it is time to exercise that prudence.